On August 21st 1997 Oasis released 'Be Here Now' the album broke the chart record for highest first-week sales, shifting 695,761 copies despite only going on sale on a Thursday, a mere three full days before the chart was compiled. 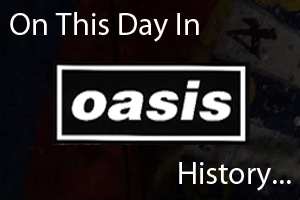 On August 21st 1994, Oasis recorded the video for the as yet unreleased 'Cigarettes & Alcohol' single at the Borderlines in London. The band treated fans who were at the shoot to a free gig, listen to a bootleg below.